With more and more people discovering the health benefits of practicing the miraculous science of yoga, this 5000- year old practice is increasingly making its way into the lives of millions. And, slowly it is seeping into the workplace. Yes, yoga for corporate people. Isn’t this just great, keeping yourself healthy and productive all at the same time. Sitting in front of a desktop with constant pressure in the head basically sums up a workplace. With changing times, increasing stress, and fierce competition, working professionals find it hard to find time for themselves, their health and family. Inculcation of yoga into the corporate scenario is an impeccable solution that benefits the employees as well as the employers. Yoga is an age-old method that brings boundless energy, robustness, and wellness to the practitioners. Taking out time to stretch your body through a means of yoga postures and vitalizing your body by the way of pranayama is the most fruitful way of reducing stress and feeling focused and refreshed. So, here are key benefits of yoga for the workplace. Have a look and inspire yourself to try the art of yoga. 1. Decreased Ailments: Deskbound jobs may have made your work a lot hassle-free as everything is a click away but the comfort comes along with a price. And you pay the price in the form of a backache. Increased back pain and related problems are the common complaints of many employees. Corporate yoga involves gentle movements that stretch the back, spine, neck, and help reduce a backache. 2. Lowered Stress Levels: Employees often face stressful situations and this constant tension extracts energy out of their body rendering them to perform lower than their potential. The performance of yoga at the workplace is the best tool to reduce the stress, to calm the mind, and to rejuvenate the body so that the employees can operate at their highest caliber. 3. Enhanced Focus and Concentration: The daily cacophony of workplace combined with pressure to perform, fatigue, etc., creates mental clutter and prevents several to focus on their tasks. In such a case, take out few minutes to practice the art of yoga and enhance your focus and concentration. 4. Give a boost to Creativity: When a mind is tranquilized and focused, it opens the creative doors and help come up with fresh and extraordinary ideas that, in turn, magnify your performance and enhance the results. 5. 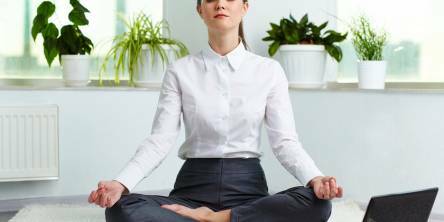 Increased Morale: Yoga practices strengthen the physical and mental health of the employees. When the workforce feels healthy, they perform better. Additionally, enhanced focus as result of yoga practices increases positivity and unleashes creativity, along with boosting self-confidence in the employees. All this is reflected in the performance of the employees. 6. Less Absenteeism: Sedentary work-life and stress is the precursor of many health problems that can lead to a higher absenteeism rate in the company. Introduction to corporate yoga is an effective solution to keeping the employees safe from the ill-effects of inactiveness, anxiety, etc., and also to lower the absenteeism rate. 7. Energized Body and Mind: Employees are bound to feel exhausted, dull, and bored due to constant sitting and straining the eyes on the computer screens. The performance of yoga postures is a great way to energize their body, mind, and soul that helps them feel fresh during their working hours. 8. Improved Physical Health: Hunching over the desktop wreaks a havoc on your body posture. Yoga is a powerful way to correct the misaligned posture, to reduce body stiffness, to enhance flexibility and so much more that keeps you in good shape to carry out your job with perfection. Introduce yoga into the office space, encourage the employees to take up the practice and make way for a healthy, happy, confident, and a better performing workforce.